Apple CEO Tim Cook is a fan of augmented reality. He's made no secret he thinks it will trounce virtual reality, even going so far as to say AR use will eventually be as common as "eating three meals a day". Today, we've gotten more from the Apple boss on what he thinks of AR, and while we're still waiting on a concrete device that projects digital images onto the real world from the iPhone maker, it seems like it's only a matter of time now. Cook chatted with The Independent during his visit to the UK this week, and in the interview Cook said he prefers AR over VR because it "allows individuals to be present in the world but hopefully allows an improvement on what's happening presently." "Most people don't want to lock themselves out from the world for a long period of time and today you can't do that because you get sick from it," Cook said of VR. "With AR you can, not be engrossed in something, but have it be a part of your world, of your conversation. That has resonance." "I regard it as a big idea like the smartphone," he said. "The smartphone is for everyone, we don't have to think the iPhone is about a certain demographic, or country or vertical market: it's for everyone. I think AR is that big, it's huge." "I get excited because of the things that could be done that could improve a lot of lives. And be entertaining," Cook continued. "I view AR like I view the silicon here in my iPhone, it's not a product per se, it's a core technology." Again, Cook has talked about his excitement for AR before, so there's no new revelation there. But dig a little deeper, and we get a few hints about how Apple might approach the tech, if ever. Cook sounds keen to have AR be both useful and enjoyable, perhaps with applications for education, medicine and the workplace, along with leisure activities, like games. He would also appear to prefer something with see-through lenses, similar to Microsoft HoloLens, that lets users stay engaged with what's going on around them while also interacting with an AR overlay. Or, perhaps like 9to5Mac points out, Apple actually isn't working on a new device at all, but rather developing more AR features for the iPhone. "I do think there can be a lot of things that really help people out in daily life, real-life things, that's why I get so excited out it," Cook told The Independent. What is more prevalent in our daily lives than our smartphones? Will Apple release AR tech simliar to Google's Tango? The iPhone 8 is rumored to have AR capabilities, including adding 3D effects to photos, and we can see Apple developing AR technology akin to Google's Tango for phones and tablets, or the Daydream mobile VR platform. Going this route would allow Apple to dive into AR without building, marketing and selling an entirely new product. 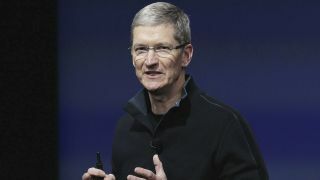 What's more, Cook said he views AR as a core technology, similar to silicon in a handset, suggesting iPhone AR could be applied to other categories, such as tablets, computers and TV. All this is certainly possible, though a recent report coming from VR/AR evangelist Robert Scoble, citing sources "at the highest levels," points to the tech giant teaming up with Carl Zeiss to develop augmented reality glasses, and a standalone VR/AR device has been rumored to be in development at Apple for some time. Cook, of course, could be talking about smart spectacles or other AR device as well. Whatever Apple is working on behind the scenes, it will likely be a while before we see it in an official capacity. Cook ended his interview with a caution there's still a ways to go before AR is "good enough for the mainstream," suggesting Apple, like it usually does, won't release a product until the tech has reached a certain level of maturity.